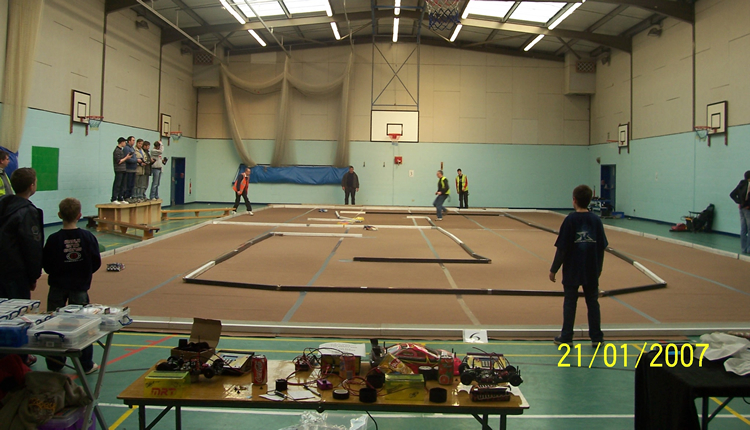 An introduction to radio controlled car racing by Chris Lillywhite. So, you're looking at radio controlled cars and may even have just recently purchased one, but you would like to know more about racing them. In this guide I will tell you a little bit about myself and the car I race with, how racing meetings are held and hopefully give you an in depth introduction to the fun and competition that you can have with an r/c car. 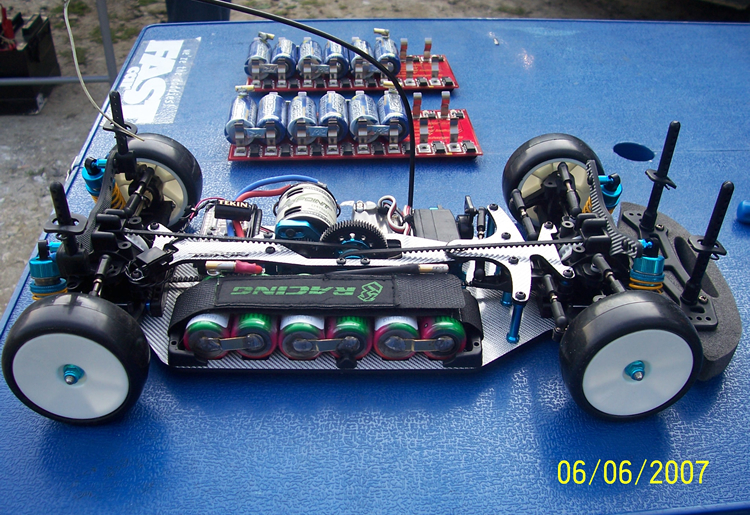 I race with a Tamiya TA05 which is an on road touring car, and it is 1/10th scale. Other cars include 1/10th scale off road buggies, 1/12th scale pan cars. Larger scales are available, such as 1/8th and 1/5th scale, but for now we will focus on 1/10th scale only as they are the most popular scale of car to start with. In r/c terms, "Pan Cars" are made from a flat "pan" of fibreglass or graphite with an independent suspension system and a solid rear axle. These cars are rear wheel drive and although are of a basic construction, can be very sensitive to adjustment. There are also Formula 1 1/10th scale cars but these are not as popular as they once used to be and although have the same solid rear axle, are not as wide as the pan cars. Some of these cars are available in both electric and I.C (Internal Combustion) format. I prefer to race with an electric car as they are easy to maintain. I.C cars are still very good to race with though, so don't let that put you off them. The descriptions of other types of cars can be found in our other featured document within the knowledge base, called introduction to r/c cars. The link to this is available here: http://www.fusionhobbies.com/kb_results.asp?ID=2 So, with some of the different cars available, back to the car I race with. The car I race with has quite a few features, including a graphite chassis, alloy shock absorbers and pivot ball suspension. It can be raced on tarmac, carpet or any other smooth surface. Off road cars are more suited to the bumpy terrains of grassy or muddy areas. The graphite chassis is very stiff. This enables the car to react quicker than say a plastic chassis. Its stiffness makes the car respond in a very quick, direct way. The downside to graphite is that it can be very easy to break and it is expensive! The alloy shock absorbers are made of high durability metal to ensure a long life and withstand any sudden impacts through the rigours of racing. The pivot ball suspension is a standard feature used in all on road touring cars, and assists in making the suspension as smooth as possible, this helps give the car its stability and handling in the corners. Newcomers to the hobby should not pay too much attention to buying their first car with all the "luxury" features. Although I have fitted my car with a quite a few optional parts I have racing model cars for 13 years so I am looking for every advantage I can find when I am racing! Before actually going racing for the first time, you may find it useful to find an unused smooth tarmac area and practise using the car. You can use some cones and make a triangle or square area and get used to controlling the car around these shapes. Later on when you feel comfortable doing them, try more difficult shapes with different sized corners to control your car around. You should find this useful practice time to understand how your car reacts to different angles of corner and how much speed and braking should be used for them. When racing, the newcomer should be focusing on getting their car around the race track as smoothly as possible, without crashing. Once you feel that you can manage that, it is then time to make the car faster (for example by changing the motor and or gear ratio) and also making the car lighter to aid the acceleration and handling, as well as changing general parts to aid the suspension and how it will react when the car is turning. My own thoughts and how I reflect on my past years racing are that it is of no use to anyone having a fast car that you are unable to control very well, although it is fun seeing and using a car going fast, model car racing should be something that you enjoy doing and this is achieved much easier when you know your own ability and your car capability better. This is the main reason why the people winning races are doing just that, not only do they have a car which has a good amount of speed, but they also have a good understanding of how to get the car around the corners in a prompt manner by making changes to suit the car and how the user likes to set the suspension and other settings. Although model car racing is very recognized in the respect that there are world championship races all over the world to decide who really is "the best" in this hobby, I would remind anyone having an interest in this hobby to set yourself realistic goals if you want to do better and get a better understanding of how to set up your car and win races. It is something that takes time and patience to get right. Do not expect to win a race the first time you go. Remember the saying.... "to finish first, first you have to finish!" It is no use having a car that's very fast, but will break before the end of the race because it is uncontrollable. There are no right and wrong ways to making your car quicker around a race track. This is because we are all very individual as to how we like to prepare a car and how it will react on the track. However, there are some guidelines to make the process easier. 1) Local knowledge of the track you race at. Naturally, the people who race at a given track week in, week out will have put a lot of time and effort into finding a setup that works well for them. Although not everyone will want to share their "winning tips" this can sometimes be a good source of information. It may not, however be of much use to everyone though so do not look at the faster cars and drivers for tips that will be 100% guaranteed to work. 2) Trial and Error. This will involve spending time (and sometimes money) trying different parts or settings on your car to make it feel better for you to control around the track. My only advice here is to be logical and only try one thing at a time. If the new part or setting doesn't make the car feel any better, go back to the part or setting you used before. There are many different things you can change on a car, I will try to cover the main areas below. The springs can be changed to a soft, medium or harder tension, depending on how you like the car to drive through the corners and the track grip available. Again, these are available in a variety of "tensions". Lighter oil allows the cars suspension to respond with less resistance. This can give the car a more positive feeling when cornering, but if it is too light can make the chassis come into contact with the race track surface and the result is less steering. In a similar way, oil which does not allow the suspension to move enough will result in less steering as the weight transfer of the car will suffer. However, do not use light springs with hard oil, or vice versa or this will result in an unbalanced feeling when the car is on the race track. Try to match the springs and oil to work well with each other. The pistons in shock absorbers are also usually something you can change, but this is not done very often, as in my experience I usually use 3 hole pistons. These relate to what position the cars wheels will be in before steering or moving the suspension. In brief, by changing the angle the wheels are sitting changes how much movement they will have in cornering and when the suspension moves. This process of tuning is not something the newcomer should worry too much about to start with, as it is very easy to change the handling of the car by changing these settings, even by changing them in the smallest amounts. Just make sure both sides, front and left are equal to each axle and are per the instructions in the build manual of your chosen car. This is a setting usually measured in millimetres (mm) and dictates how much suspension movement there is between the ground and how high up the chassis is positioned on its suspension and wheels. Usually a setting of 5 to 6mm is ideal for both the front and rear suspension on most race track surfaces. Although car setup is important, try looking at where the faster cars will be going on the race track at any given point. They are usually on this part of the track every lap (unless a mistake has been made) and this is because it is the fastest way, (or route) to get around the race track. If you are racing the same route every lap and not crashing you will achieve good lap times, and in turn a good qualifying time or final race time if it is the main racing of the day. As I have said before, a fast car is no use in racing if it is not going round the corners in a prompt fashion, as you will loose time by taking the wrong route into or out of a corner, or simply not being able to carry enough speed around the corner. Is the car looking as well as its owner? Needless to say, all your hard efforts of practising will not help if the car is looking worse for wear. Check moving parts frequently for signs of wear and tear. Competitors do not turn up at marathon events with flu, likewise arriving at a car club meeting with a car that looks like it will fall apart on the first corner of its race will not help your racing. Be logical and learn to do the repairs on your car yourself. If others do it for you and the car isn't rebuilt properly you won't be very happy, at least if you do any repairs or changes to setup yourself you have gained the knowledge of working on your own car. Just like in racing and being on the race track, the more time spend working on the car the more you will learn and gain from it. Inspect your tools for wear and tear before they fail completely. Then, should you need to repair your car or change its settings in a hurry, your tools will be in a good condition for you to do this. A crystal is the frequency your car is operating on. Frequencies are measured in megahertz (MHz) and are available in 27 and 40 MHz for model car racing. There is also the "Spektrum" transmitters which do not utilize the traditional crystal frequencies and will not interfere with them. Each car will need to use a different frequency, or you can imagine what happens when two people are trying to control their own car but with the same frequency.... It will get expensive when they crash! That is why it is always very important to find out which frequency other cars in the area are using before switching your own car on. So you've now maybe had time to use your car and controlled it around some cones, understand the different settings on the car and what different parts do, but remember not to get nervous about your first race meeting- Remember, we are all racing to have fun! Smile Where can I find information on model car racing events? There are some listed in our own forum, however if these are not local to you or do not race the type of car you own, the BRCA is the U.K. recognised organisation that model car clubs are members of. You may need to join the BRCA to become a member of a model car club, the club you choose to race at can advise you of further information should you require it. The website link to our forum is: http://www.fusionhobbiesforum.co.uk/forum The website link to the BRCA is: http://www.brca.org/ Click on the "clubs" text to the left of the page for details of model car clubs local to you. The racing and how a typical race day unwinds. Well, hopefully by now I have given you a good understanding of model cars, how to prepare them for racing and how to be mentally prepared for the race day itself. Allow yourself plenty of time to get yourself to the race meeting and print any instructions off the clubs website if it helps you find it easier. Introduce yourself to the clubs representatives. One of these can usually be found behind a computer, which is connected to the lap counting equipment the cars will use for the racing. You will be asked for your name, what crystal you are using and what kind of car you are using if there are different types of car being raced at the same meeting. Now is also a good time to ask the race organisers any questions you may have about the racing session. Typical questions include: Am I allowed to use the track for some practice before the official racing starts, where are the toilets, how does the qualifying racing proceed and how long is each race? Get your equipment and car ready on a table (or your chosen area), and a comfortable seat for the time you need in between your races to inspect your car and make any changes or repairs to it. Have your tools close to hand and any parts you may need. Once you have done this, make sure you have enough time to have a fully charged battery ready or you will not be racing! Whilst you are doing this, the race organiser will usually announce that the "heat listings" are ready. The heat listings are groups of racers put into a group and will be racing with each other for the qualifying races. Look for your name and ensure the crystal frequency you gave the race organiser is the one on the heat listing. Heat listings are usually printed out for you to view, but are sometimes displayed on computer displays too. Each car in a heat will have a number. It is very important to remember what this number is! The reason for this is it will be the number used on the clubs computer to record your laptimes. To do this you will need a "transponder". There are two types. One of which is handed out by the club organisers and you will need to attach this to an easily accessible place on your car. Typically this is on the front windscreen. The other type is something you can purchase from any good hobby/model shop which caters for radio controlled cars. Without getting into too much detail, it will connect to your receiver and will have its own unique number. You will advise the race organiser of this number when you go to book in for your days racing. For the time being it is easier (and cheaper) to use the club supplied transponder, but remember to give it back as soon as every race of yours has finished, as the next heat of races may need it for their race! So, with your car and you being as ready as can be, get ready for your race and go to the driver's podium where you will stand for your racing. When it is deemed ready for you to switch on your cars equipment, first switch on your transmitter, then the car. Place your car, or drive up to the start finish line of the race track, (or wherever the race organiser has told you to start your race from). In qualifying, your race number is called out and this is your cue to start racing. Qualifying races usually last for 5 minutes, when the 5 minutes have been counted from the start of the race an alarm tone is usually heard to advise every racer on the track that the race is now over. Finish the lap you are on and when safe to do so, move to the outer side of the race track and switch off your car, then your transmitter. If you were unfortunate enough to have broken your car in a qualifying heat, a marshal will remove your car from the race track and hand it back to you, remember to hand your transponder back to race control before returning your car to your pit table area. Then put your car on your pit table and go back to the race track to marshal the next qualifying race. This is something that many racers will not like taking part in, but should remember if there were no marshals for their race, they would not be able to continue their own racing if they crashed! So on that basis, always remember to go out to marshal after you have just raced. If you are not sure where to marshal on the track, speak to the race organiser before the race you are marshalling starts. There are a few general procedures to marshalling, but the most important one is to be alert and focused on the area of the race track you are marshalling. Resist the temptation to look around the whole track and watch the racing unwind. Here are a few other things to take into consideration. 1) Marshal other cars the same way you would want to be marshalled- In other words, when you put a car back on the track, gently put the car onto the track, never from a height. 2) Make sure there are no oncoming cars before putting a crashed car back onto the track, it could result in injury, be very expensive and could end your competitors day of racing. We are all racing to have fun, with as little accidents as possible Surprised) 3) Place track markings back to the place they were first at if a crashed car has moved them. Failure to do this may mean the track is very narrow and not very easy to drive around. With the marshalling now over, it is time to go back to your pit area and make any adjustments or repairs to your car. Maybe even have something to eat or drink and relax yourself. Typically, there are 3 or 4 qualifying races, then an allocated space of time for practice or a lunch break for example, and then the "finals" will start. Let us use a typical example of how the finals are calculated and how it is done, then apply it to your own racing. If there are 40 competitors there would usually be 4 races, each with 10 cars in each race. The reason for this is that most of the electronic lap timing systems can only accommodate 10 cars, and not forgetting a very important reason any more than 10 cars on a small racetrack is going to make the racing very difficult for you all, to say the least. The finals are usually lettered, the "A" final being for the 10 fastest competitors in qualifying, the "B" final for the cars that were 11th to 20th fastest overall in qualifying and so on. The race organiser will usually print a list out of all the finals for you to view. The fastest qualifying car for example in the A final uses transponder 1, the second fastest transponder 2, and so on. So, bearing this in mind, take the correct number of transponder and attach it to your car. The cars are lined up, usually in a staggered grid formation and then a countdown buzzer will start for 10 seconds prior to when the cars are allowed to start the race, usually in one second intervals. The last one is your cue to get going, as quickly as possible! Surprised) If you are starting lower down in the grid, remember the first corner of the race is where a lot of incidents will occur when everyone is trying to out accelerate the opposition, so you may need to take a very sudden change in route to avoid a crashed car! Keep your calm and remember this is not a race for thousands of pounds, or a race to get instant fame, it is just one of many races you will encounter if you choose to keep racing model cars as one of your hobbies. Once your 5 minutes has finished the finals times will be printed or shown on a display and you can then smile and look at how well you did, or think about what went wrong and how to make things better the next time you race. You will then need to hand in your transponder to race control (if you are using one supplied by the model car club), and pack away your equipment and head off for home. I hope this has given you a good idea of what racing is about and what enjoyment this hobby brings, from all of us at Fusion Hobbies, we wish you all the best in your future racing!